WhatsApp 'Delete for Everyone' feature that allows users to delete sent messages is now rolling out to all users, a week after it trickled out to select users of the app. The feature lets people call back messages sent on individual chats as well as WhatsApp groups, and is available across different platforms, such as Android, iPhone and Windows Phone. One of the biggest use cases of the Delete for Everyone feature can be when you send a message to the wrong chat or if the message sent contains a mistake. 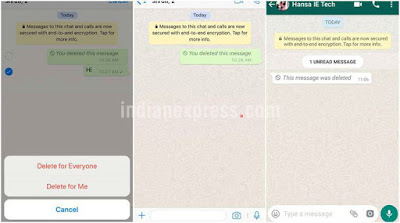 It is the latest feature added to WhatsApp in a long list of features introduced this year, and is biggest change to the chat app since blue ticks. · Make sure you the latest version of WhatsApp is downloaded on your phone. The recipient must also have the latest version installed for the Delete for Everyone feature to work.